At first glance, the Asus K50IJ is a stylish and inexpensive 15-inch office notebook intended for those who don't have high demands on performance. Find out in our extensive review to which degree this first impression holds good. Asus has designed their K-series for everyday home use. They're sufficient for internet surfing with WLAN and word processing, but not for more complex tasks such as 3D games or video editing. That doesn't mean that Asus has completely left out multimedia qualities: Altec-Lansing speakers and a DVD drive make K-Series notebooks to portable movie players. We have reviewed the SX145V model of the K50IJ, which has a Pentium Dual Core T4300 Processor, a 4GB RAM and an onboard Intel GMA 4500M HD graphics, and costs just over 500 euro. Unlike some other entry-level notebooks, the K50IJ neither looks conservative nor cheap: shiny black plastic surfaces show subtle patterns with larger and smaller dots. In addition there's a shiny silver Asus logo on the upper side and the workmanship looks extremely solid. 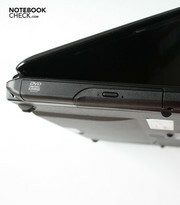 Creaking or twisting is not noticeable when the 15-inch notebook is picked up at the edges. The lid however, allows strong pressure applied to the back to appear on the screen and it can also be twisted quite strongly. The hinges that hold the lid are stable, but still work smooth. They keep the lid in position after a short luffing and also secure it in the closed state. The dimensions are well within the norm with 37 x 25.6 x 3.5 centimeters. Beveled edges let the notebook look even more compact. Also the weight of 2620 grams and 320 grams for the power supply turn the K50IJ into a highly mobile companion. Asus has built connections on all four sides of the K50IJ. The front has a cardreader, which can accommodate multimedia cards, and memory sticks. The speakers, which we'll discuss a little later, are on the left and right side. On the left-hand side the user can connect two USB-2.0 devices to the K50IJ. A DVD drive follows behind the USB ports. The right provides a 3.5 mm jack for headphones and microphone, and behind them two further USB 2.0 ports, a VGA-out, a LAN port and DC-in. Two connections for Kensington security locks can be found on the rear's left and right. Four USB ports are a fine thing per se. As two of them are on the right and two are on the left, it should be convenient for both, lefties and righties. Of course, a digital display interface would have been great too, but, considering the price, you can't complain much in terms of connectivity. The notebook supports the new standard 802.11n as wireless interfaces. This means even faster internet connections should not be a problem for the K50 in future. 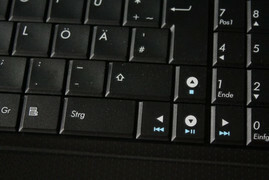 The Asus K50IJ has a keyboard with 88 keys and an additional numpad, whereas the keys are a bit narrower than on the main keyboard. Especially the letter keys and the most important special keys, like return and CRTL have the same size as a normal PC keyboard. All keys have a fairly pliable stroke that you just have to like. Apart from that, you can write very well on the K50IJ. Both the wider, as well as the narrower keys are palpably well separated from one another and are concave so that you hit the intended keys. Even the narrow number keys can be used sufficiently and the key distribution, with exception of the narrow numpad zero, doesn't give reason for complaint. The hot keys, which can be addressed in combination with the FN key, have been imprinted in light blue so that you can recognize them well and they are distinguished from the white imprint of the normal letter keys. The touchpad has been placed far left below the space bar and can be differentiated because it's been slightly submerged, as well as having a knobby structure, in comparison to the palm rest. The surface structure makes the touchpad a little stiff, at least with the default sensitivity. 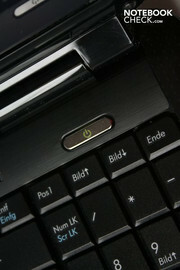 The touchpad does not recognize multi-touch gestures and has no scroll bars on the right or bottom side. Both touchpad keys, underneath the touch-sensitive area, are made made of silver plastic and have a somewhat indistinct pressure point, but with a very rich click sound. It is always detected reliably. Overall, the touchpad works well, although or maybe just because it doesn't have any special features. The Asus K50IJ's glossy screen measures exactly 15.6 inches. 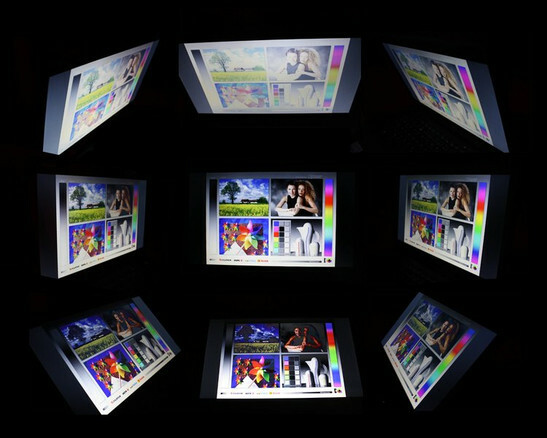 The maximum resolution of the LED-backlit display is 1366 x 768 pixels. Subjectively, the glossy coating, which Asus called 'Color Shine', makes colors look rather intense. At first sight, the contrast seems to be in order, just like the maximum brightness of the screen. In fact, the display is quite all right for the price: The illumination varies wildly between 154.3 cd/m2 in the top center and 248 cd/m2 in the lower middle section, so a dark veil can be seen in large color areas on the screen . The black value of 0,84 cd/m2 is quite low, so darker colors seem really dark on the screen. Also, the contrast of 236:1 is not a peak, but it is in the solid midfield. Working outdoors is difficult with the glossy coating, especially because the illumination is not high enough. Also, the vertical viewing angle is limited: if the screen is tilted backwards, color shifts are clearly visible. This effect, as in most favorable panels, is not quite as bad in the horizontal viewing angle, however, it is evident as of a certain angle. 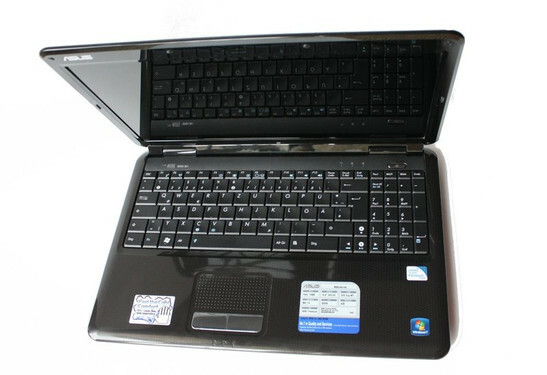 Overall, the screen reaches a score of 70 percent, which can be denoted as quite good in view of the laptop's low price. However, displays of more expensive notebooks struggle with the same problems. An Intel Pentium T4300 dual-core processor, installed in the Asus K50IJ, clocks with 2.1 GHz. Intel's Graphics Media Accelerator 4500M HD, which is favorably used as a graphic card, uses a portion of the main memory for the video memory. 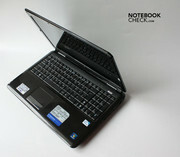 The processor is quite powerful for an entry-level notebook and should be able to cope with all standard applications. The graphic chip is sufficient for basic multimedia activities and shouldn't have any problems playing HD videos from the Internet , in conjunction with the processor, either. We tested this by using a trailer from the Internet in Full HD resolution. Picture and sound ran in sync and without stuttering even in power-saving mode. Thus, multimedia fun with the K50IJ is well on the road almost without limits. High quality flash content will also run smoothly, however, here one shouldn't enable the power-saving mode. 4096 MBytes of memory is included, but these are slightly slower DDR2 800 modules. 4 GB is also the limit, because the operating system doesn't support more memory. These hardware specifications are already quite remarkable for an entry-book and so the K50IJ doesn't do so poorly in our performance test course at all: Older games should be playable in any case, confirmed by 2167 points in 3DMark03 and a solid 1169 points in 3DMark05. However, the onboard graphics is too weak for newer games. The application performance is fueled particularly by the dual-core processor, which is made possible by 4415 points in Cinebench R10, at least, if an application uses all cores. Otherwise it is only 2040 points. PCMark Vantage also indicates that this system is quite fast as it achieves 3141 points in the overall rating. Asus' entry-level notebook turns out to be a good choice for those who do not want to forgo on a fast processor, in any case. Because the vast majority of applications now support two computing cores, the processor should be able to manage somewhat more demanding activities in combination with the large memory, such as editing large photos. However, applications that require a strong graphic card quickly reach their limits with the onboard GPU. The DPC latencies indicate how well the system streams data to external devices such as external sound cards. The DPC Latency Checker shows that the K50IJ initially performs quite well, but in the end it swings into the red, so the system can't be considered a reliable data supplier for external sound cards, for example. 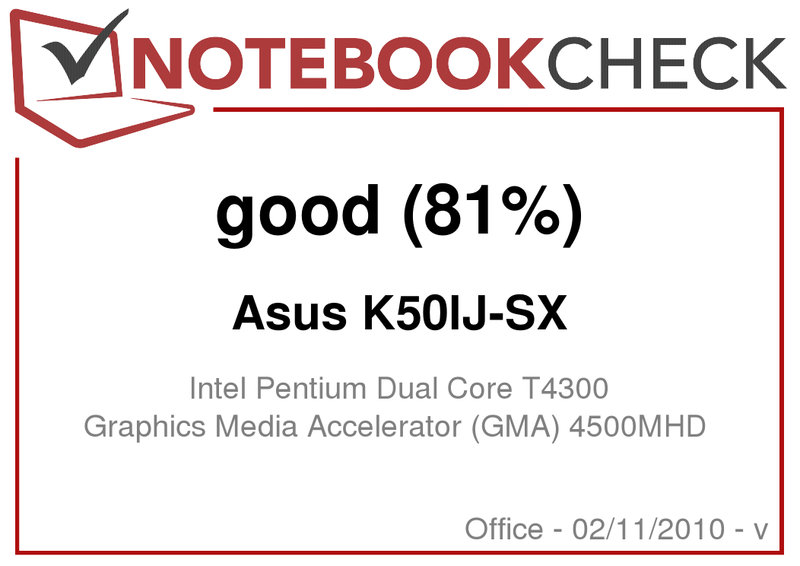 The noise of the Asus K50IJ appears to be very low after first listening. This is confirmed by the objective test results: 32.1 dB (A) is the minimum test result; you really have to lean very close to the device to hear it at all. This noise doesn't change in idle mode even after a long time. The hard drive also fits well into the sound environment with 32.7 dB (A). 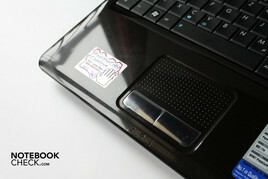 Asus promises "Cool Comfort" for the K50IJ's surface temperature, which means a cool palm rest. The temperature is to be 25 percent under body temperature and thus, stays really cool. To achieve this, all heat-producing parts such as processor and hard drive were moved into the back of the notebook and the evolving heat is also routed to the rear. Asus seems to keep its promise: If we assume a body temperature of 36 degrees, then the palm rest should have the temperature of about 27 degrees Celsius, according to Asus. And it does: In idle mode, we get 26.6 degrees, which is pretty close to that value. If we stress out the notebook, the left and middle part continues to be cool, but the temperature rises up to 31.4 degrees on the right side. Nevertheless, it's a hardly perceptible warming. We measure up to 46.4 degrees in the rear center field under full load. That is already quite warm, especially since the surrounding areas protrude into this temperature range. However, the bottom is very cool in idle mode: Here we measure 32.9 degrees Celsius. Even the compact power adapter with 47.7 degrees Celsius stays in a non-critical area, although it may serve quite well as a hand warmer. (±) The maximum temperature on the upper side is 40.7 °C / 105 F, compared to the average of 33.9 °C / 93 F, ranging from 21.2 to 62.5 °C for the class Office. (+) In idle usage, the average temperature for the upper side is 28.1 °C / 83 F, compared to the device average of 29.4 °C / 85 F.
(+) The palmrests and touchpad are cooler than skin temperature with a maximum of 31.4 °C / 88.5 F and are therefore cool to the touch. (-) The average temperature of the palmrest area of similar devices was 28.2 °C / 82.8 F (-3.2 °C / -5.7 F). Despite the relatively low price, Asus did not save money on speakers. Asus installs speakers from the sound forge of Altec Lansing into its entry-level series, whose products are also used in large multimedia and gaming notebooks. Accordingly, the sound is quite good, though lacking the power of a subwoofer. However, the maximum volume is not outstanding. The positioning underneath the K50IJ's front edge is also rather sub-optimal, since the speakers sound towards the bottom and not in the direction of the user, and secondly because they can be obscured by soft surfaces, so the sound is muffled. Overall, one can be more than satisfied with the quality of the sound in this price range. The battery is hidden behind a flap on the bottom. The battery comes from Asus and has a capacity of 49.6 watt-hours. It hides behind a double-secured flap on the bottom. The lithium-ion battery contains a total of 6 cells and brings the device to a maximum battery life of 5 hours and 11 minutes. However, to achieve this duration, one should not demand his laptop too much and really needs to activate all energy-saving features. Under full load, the duration decreases drastically to just 84 minutes. Because both values are quite theoretical, we also determine the average battery life in a practical test by surfing in internet via WLAN, with some power saving mechanisms and normal brightness. The result: 237 minutes or 3 hours and 57 minutes, a very good value. Overall, the battery life of the Asus K50IJ is so good that one can even work with the device on the road. On longer trips, however, you'll either need a second battery or occasionally look for an electrical outlet to recharge. In accordance with the battery life, we assume that the minimum and maximum power consumption of the system also differs quite dramatically. And indeed, the rates fall within the range of 9.2 watts in idle mode to 42.7 watts under full load. The system uses about four and a half times as much energy when it is put under full load, although the values are within norm for this class of equipment. In fact, if we put aside any possible anomalies in measurements, the laptop consumes almost no electricity in standby mode. The computer only draws 0.3 watts from the power outlet in standby mode. Asus' K50IJ is a stylish entry-level notebook that has some clever details that make it worthy of a second look from performance-undemanding computer users: First, the palm rest will always be cool and allow you to work comfortably. Second, the notebook is quiet and portable enough to not attract attention, making it pleasant to carry around. The relatively powerful dual-core processor also makes a good impression, just like the manufacturing and the features such as the four USB ports, which are distributed over both sides of the chassis. The power of K50IJ is not enough for current games, but you can certainly enjoy older classics. Also, the multimedia qualities are above average: Our tester had no problems with HD video. The good input devices, including the numpad, the moderately decent screen in terms of value for money, the sleek design and the fair price round off the offer. This is only negatively affected by the rather high temperature under load, the lack of digital video output and unfavorably positioned speakers. ...and touchpad are quite reasonable for the price. However, the screen provides only average test scores and is strongly reflective. ...and the rounded corners that make the notebook seem even more compact. Together with DVD drive, the K50IJ is almost a multimedia machine. ...which deliver a solid sound. ...wants to especially catch customers of the entry-level sector. ...even the hinges are firm and stable. Asus takes security very seriously, and places two ports for a Kensington lock on the rear. Asus offers a good overall package at a reasonable price. How good an inexpensive notebook can look. Sony Vaio BZ is also nice and even has a metal casing and is more powerful, but also a bit more expensive. Also for a little more money, there's the Asus P50IJ, the business twin of K50IJ with matt screen. However the Samsung E251 Esilo is cheaper with 399 euro, but it also comes with a duller design.